If you remember just over a week ago Mari, from Mari’s World asked me for some design inspiration for her bedroom makeover. Mari would like to create a chill out zone for her and her husband, a sanctuary away from the hub-bub of daily life. 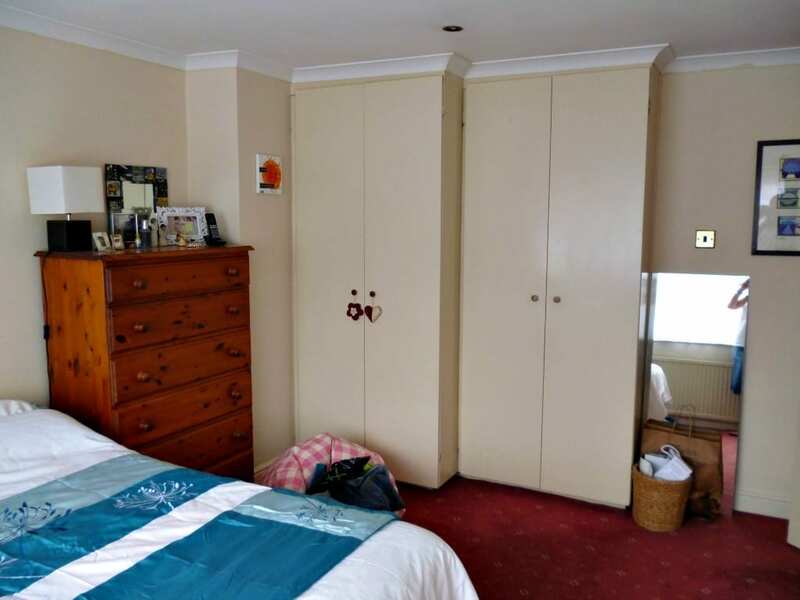 There were some aspects and features in the room that needed to remain, such as the spotlights, the wardrobes and the good quality carpet. Everything else could be altered or changed. I talked to Mari a little more to find out more about her style, her likes and dislikes and what else she might like in the room. Style: Mari’s style is one of home comforts with a modern edge. Nothing too minimal or hotel styled, but functional, practical, personal, clean and tidy. Inspirations: Mari would like some colour in the room, something fun and quirky perhaps behind the bed. She would also love a headboard with storage and/or a shelf for her personal pictures, and to store her book. Budget: We’re keeping things economical with the makeover and working with lots of the current fixtures to create something comfortable and cosy. 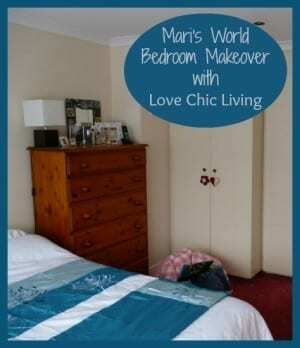 My ideas for Mari’s bedroom are focussed around warmth and classic, modern style. I wanted to give her a chic, grown up sanctuary in which to relax, but incorporate the features in the room that she wants to keep. Colour Palette: This was the tricky bit! Trying to incorporate Mari’s love of navy, silver and grey with the pink in the carpet, and not create a scheme that’s too girly or feminine was quite tough. One of the key colours for the Autumn season is going to be Ink Blue (think dark blue with shades of purple/black) which works beautifully with the rose coloured carpet. Incorporating a very pale grey and a contrasting shade of yellow or lime to add some zing should create the look that Mari is after. I would suggest painting the walls in a very pale shade of grey like Farrow and Ball’s Cornforth White or Elephant’s Breath. Window Treatment: The bedroom needs privacy and Mari was interested in changing the curtains. So I suggest taking away the net curtains and replacing with sleeker, more streamlined window film (7). This comes in all shapes, sizes and finishes and can be applied very easily. It lets in light but creates complete privacy. Choose a design from somewhere like Purlfrost or Brume according to the dimensions of your window. Then I would strongly suggest fitting roman blinds (2) rather than curtains so the radiator below the window is still exposed. I think this is probably one area to allocate a reasonable amount of the budget and as it’s a big window fit 2 separate 1.5m metre blinds. Wallpaper: The wall behind the bed would look fabulous with some wallpaper and I’ve chosen this Graham and Brown ‘Twine’ design (1) at £20 per roll in beautiful blues and greys to complement the colour scheme. 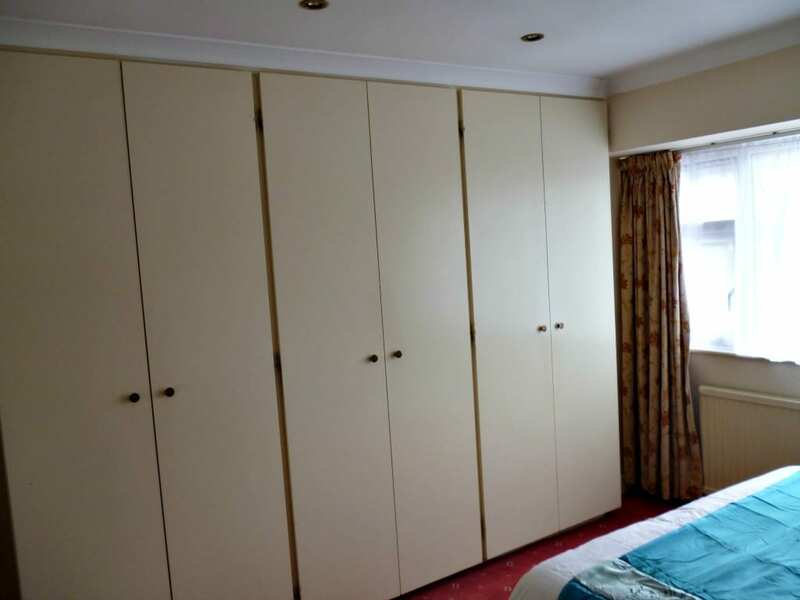 It would really help take the focus away from the dominating wardrobes and give the room a real centrepiece. 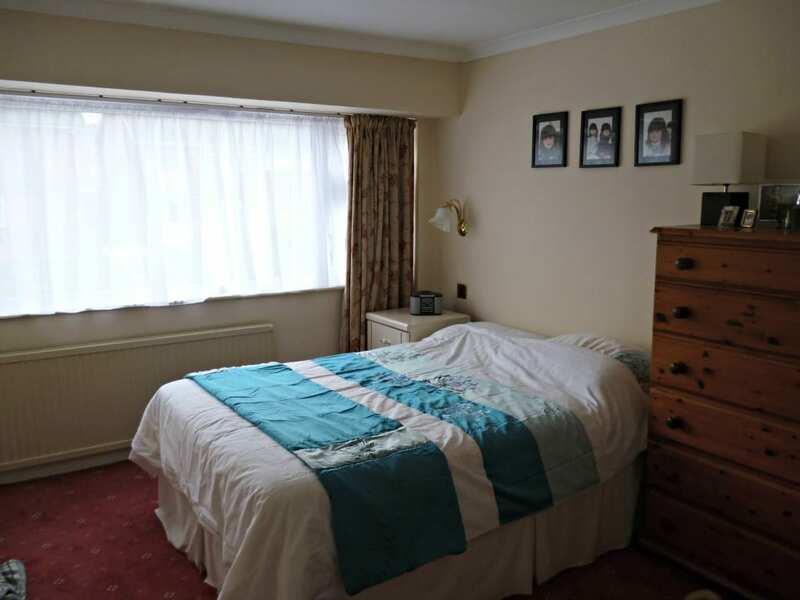 The stripes aren’t too feminine and co-ordinate with the bedding and other soft furnishings. Alternatively, if Mari doesn’t want the wallpaper, a striking piece of art above the bed would also work to create the same statement. Furniture: This is where some real changes can be made. Mari has said there’s space in the wardrobes to accommodate the contents of the chest of drawers so that’s what I’d suggest doing. The bed needs a headboard (4) so I chose this storage style example from IKEA costing £85 that provides a shelf or personal photographs and side storage for books and other bits. There are 2 light fittings once the chest is removed, which could be updated with something sleek like this one from John Lewis (3) at just £20 each. With the storage in the headboard you won’t want too much in the bedside tables (9) so I chose something simple, classic and white from IKEA at just £40 each. Wardrobes: Paint the wardrobes in an off white or pale grey to work with the wall colour and change all the knobs to something like these from Homebase (8) at £5.29 each. Soft Furnishings: This vibrant colourful bedding (5) is from a range at Scion, a sister company of Harlequin. Tree bedding and matching cushions and pillows come in this beautiful ink blues and pinks on a lovely crisp white cotton. It’s not the cheapest of sets at £50 for the double duvet cover but will give the room real warmth and focus. Add simple pink and blue cushions to add some comfort to the bed. Accessories: Add lots of lovely, homely accessories like the pink candle (6) and all your personal photographs of the children. Use the colours from the colour palette to really bring the scheme to life. The TV: This is a tricky one and without seeing the interiors of the wardrobe I can’t be sure, but I would suggest finding a spot inside one of the wardrobes to wall mount the tv on a bracket. This way it can be pushed back and ‘hidden’ when not in use. Alternatively, if this idea won’t work for you look to putting on the wall near the mirror with an extending wall bracket. And so there we have Mari’s Bedroom Inspiration. I would love to know what you think? Would you like me to create a moodboard for a room in your home? Very soon I’ll be launching the Love Chic Living Consults service where I’ll be doing just that so do get in touch if you’d like to know more. Ooh you are so clever at bringing all the existing and new elements together. I love the colour palette, having that moodboard must make it so easy to pick out things, from ornaments to picture frames. Next time we makeover a room I am going to use your services Jen. What a lovely colour palate they suggest for you- looks lush! Gorgeous, absolutely gorgeous Jen, you have nailed my dreams on the head. I love that headboard and the prices are all within our budget. I’m really looking forward to doing the bedroom up and showing you what I’ve managed to do with your ideas .